In the fall of 1909, Baylor alumni received a surprising invitation from their alma mater. A postcard signed by three professors asked the graduates to return to campus to "renew former associations and friendships, and catch the Baylor spirit again." It was the announcement of Baylor's first Homecoming. And at the bottom of the card, the organizers felt compelled to add: "It is not to be the occasion for the raising of money for any purpose." According to the 1910 Round-Up, a massive campaign of correspondence, advertising, and organization lured graduates to the celebration planned for Thanksgiving weekend. On Wednesday, November 24, the first-ever Homecoming began with a band concert, followed by a reception hosted by President Samuel Palmer Brooks and an "old-time soire" in Burleson Hall that evening. The next day, class reunions began at 9 a.m., and an hour later there was a program of speeches by professors, administrators, and alumni, with musical interludes by student groups. Topics for the speeches included "Dr. Burleson's Chapel Talks," "Baylor Men as Citizens," "How I Felt Once When the Other Society Beat Mine," and "How I Came to Love the Baylor Girls." At 2 p.m. Baylor launched its first Homecoming parade from the corner of 11th Street and Washington Avenue. Parade entries numbered well over 130, with 60 each of automobiles and carriages, plus student organizations on foot. As it is today, the parade was led by law enforcement and the Baylor Band. The yearbook notes that the musicians were "in white uniform, led by their giant drum major, who, even without his great bear-skin cap, measures six feet six inches-all man." The vehicles, it was noted, were "tastefully decorated with green and gold bunting and pennants; some automobiles were even profusely ornamented with yellow chrysanthemums." The entire city of Waco joined in, the Round-Up reported, with businesses and residences decked out in "extensive" decoration. "Thousands of people wore the Baylor colors, while hundreds of vehicles, the street-cars, and even the bicycles of the messenger-boys were ornamented with Green and Gold. The city was truly in gala attire." The parade must have moved rather quickly because the football game started just 30 minutes later on Carroll Field. Nearly 5,000 people attended the football game, which was the final one of the season. Seniors wore caps and gowns to the game. 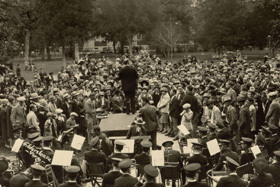 While many Homecoming celebrations around the nation originated in the late teens or 1920s, few were as early as Baylor's. 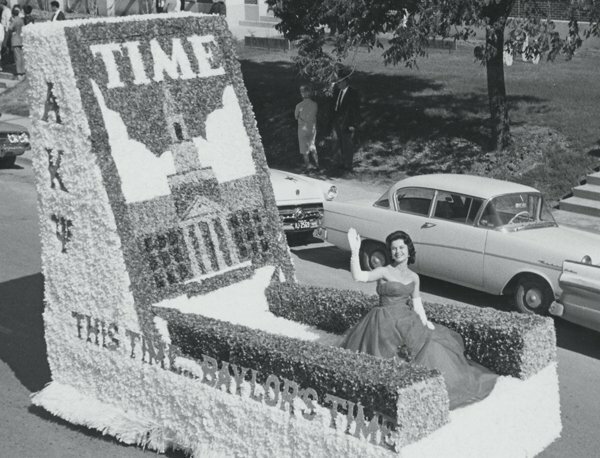 But whatever its claims to age or originality, the first-ever Baylor Homecoming was much like all the rest in one respect--in the words of the Round-Up editors, "It was a sight long to be remembered." The next Homecoming didn't occur until 1915, when the alumni association took over official sponsorship of the activities. Usually held on Thanksgiving weekend, early Homecomings were held sporadically until they became an annual event in 1934 when the name was changed from "Good Will Week" to Homecoming and brought under the direction of the Chamber. Parts of the schedule--the morning parade, the afternoon football game, and reunion parties for classes--remain remarkably unchanged after nearly a hundred years. But there's one tradition from that original Homecoming that alumni would no doubt like to see revived and repeated year to year--on Thanksgiving Day of 1909, Baylor won its Homecoming football game.